Summary In the US, patients who initiate dialysis “early” (at Modification of Diet in Renal Disease estimated GFR [eGFR]> 10 ml/min per 1.73m2) account for over 50 percent of new dialysis starts. This trend to an early start is based on conventional wisdoms regarding benefits of dialytic clearance, that albumin levels are nutritional markers, and early dialytic therapy is justified to improve nutrition especially in diabetics and that waiting until low levels of eGFR (i.e., <6 ml/min per 1.73m2) may be dangerous. In order to justify early dialysis treatment, the therapy must provide a morbidity, mortality, or quality of life benefit. The current review examines whether early dialysis initiation provides any of these benefits and whether the conventional wisdoms that have promoted this early dialysis trend are valid. Utilizing this information and the results of recent large observational studies and the randomized controlled Initiating Dialysis Early and Late (IDEAL) study, we suggest that dialysis initiation is justified at GFR levels of 5–9 ml/min/1.73m2, if accompanied by uremia symptoms or fluid management issues. When repetitive dialysis therapy for ESRD first became available about 50 years ago, it was provided to a select population with minimal renal function. In an effort to improve mortality, starting dialysis early was promoted by small observational studies (1–3). The trend to early dialysis initiation (arbitrarily defined as an estimated GFR [eGFR] ≥10 ml/min per 1.73 m2 utilizing the four variable Modification of Diet in Renal Disease (MDRD) equation) has evolved partially based on conventional wisdoms (CWs) (Table 1). Several publications that included guidelines for dialysis initiation promoted the CWs that dialytic and endogenous renal clearances are comparable and affect patients' morbidity and mortality; that early initiation of dialysis is necessary to prevent and reverse deterioration of nutritional status associated with declining renal function; that diabetics require earlier dialysis initiation than do nondiabetics; and that waiting until eGFR fell below 6 ml/min per 1.73 m2 to initiate dialysis is dangerous (4–7). These views partly explain the dramatic trends to early dialysis initiation in diabetic and nondiabetic patients in the United States (Figure 1). Between 1996 and 2008, the percent of incident ESRD patients initiating hemodialysis at an eGFR ≥10 ml/min per 1.73 m2, with or without diabetes, rose from 25% to 55% and from 16% to 48% respectively (8). New dialysis starts in the United States by year in patients with and without diagnosis of diabetes. The percent of the new starts with eGFR >10 ml/min per 1.73 m2 in diabetics and nondiabetics increased from 25% to 55% and from 16% to 48%, respectively. 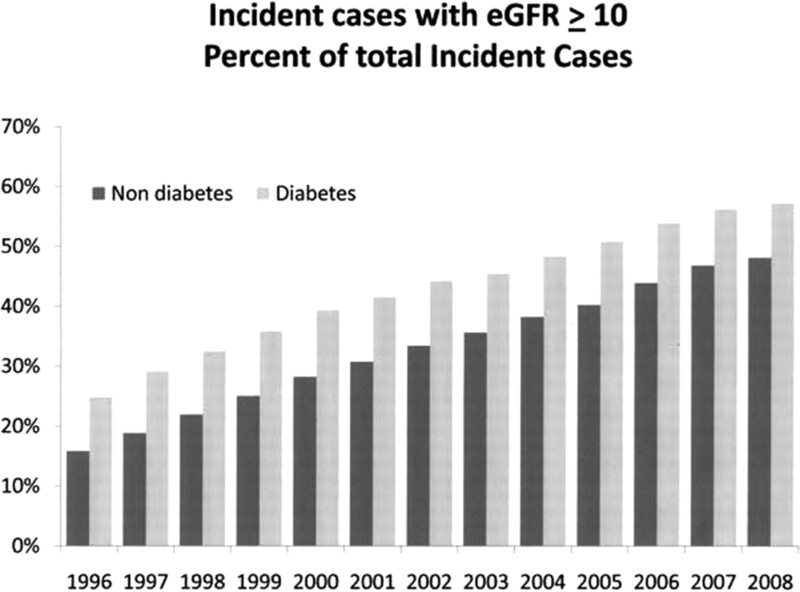 The percent of the incident population with eGFR >15 ml/min per 1.73 m2 rose from 6% to 20% and from 4% to 17% in diabetics and nondiabetics, respectively. We examine published literature concerning the decision to initiate dialysis early and propose a new paradigm for dialysis initiation based on the fundamental requirement that such therapy should provide a mortality, morbidity, or quality-of-life benefit to the patient. We also introduce a theoretical concept of “renal function trajectory,” defined as the decline in renal function over time as one of the important factors in the dialysis initiation decision. Is Early Dialysis Initiation Justified by Its Effect on Dialytic and Endogenous Renal Clearance and Nutritional Parameters? The first CW (Table 1) can be traced to the 1981 National Dialysis Cooperative Study that provided the data for Kt/V urea as a predictor of morbidity and mortality (9,10). In 1992, the second and third CWs were addressed by two, large cross-sectional hemodialysis population studies, which reported the relationship between serum albumin and survival (11,12). Serum creatinine and albumin levels predicted survival. After adjusting for these levels, diagnosis of diabetes did not predict survival. Serum albumin was 21 times more powerful as a predictor of mortality than urea reduction ratio and replaced diabetes as a risk factor for death (12). Diabetics had lower serum albumin levels and urea reduction ratio than nondiabetics. Thus, this publication may have indirectly promoted earlier dialysis initiation in diabetics. In 1995, Hakim and Lazarus advocated an early initiation strategy because it resulted in a “significantly better outcome,” partly by improving nutrition related comorbidity (4). These and other authors (3) compared endogenous renal function to dialytic low-molecular-weight (urea/creatinine) clearances (3,4). The Canadian-US Peritoneal Dialysis Study (CANUSA) study found better survival with initial renal function (average of urea and creatinine clearance) >3.9 ml/min (5). In 1997, the view that dialytic and endogenous renal clearances were comparable was further suggested by the CANUSA study (13). Five years later, this CW was found wanting by two well-executed randomized controlled trials: one in a peritoneal dialysis population, the Adequacy of Peritoneal Dialysis in Mexico trial, and the other in the hemodialysis population, the Hemodialysis (HEMO) study (14,15). Both of these studies found no survival benefit from increased dialytic clearance of low-molecular-weight solutes. By 2005, five studies, including the Netherlands Cooperative Study of the Adequacy of Dialysis Treatment study of hemodialysis and peritoneal dialysis patients and a reinterpretation of the CANUSA data, firmly established that residual renal function and not dialytic clearance of low-molecular-weight solutes was associated with improved nutrition and patient survival (16–20). Protein intake declines as renal function declines (21). Although there were no studies to directly prove that dialysis improved nutritional measures, in 1993, Hakim and Levin stated that “circumstantial data” made it safe to assume that dialysis would reverse the anorexia of renal failure (22). In 1995, Bergstrom reported that the only potential benefit of hemodialysis on nutrition was correction of metabolic acidosis, which may decrease muscle protein catabolism (23). Hemodialysis stimulates loss of amino acids and protein catabolism (23). Two studies have shown beneficial effects of dialysis on nutrition in incident patients during the first year of dialytic therapy and one showed improvement of nutritional parameters with oral nutritional supplements provided during dialysis (24–26). The presumed mechanism for this beneficial effect of starting dialysis was related to improved appetite and dietary intake of calories and protein that overcame the catabolic effect of dialysis treatment itself. The HEMO study followed 1846 prevalent hemodialysis patients for over 3 years. Utilizing two levels of dialysis dose and two levels of dialysis solute fluxes, neither serum albumin nor anthropomorphic measures of nutrition improved, despite an increase in dietary protein and energy intake (27). In fact, all nutritional parameters showed a small but statistically significant decline (27). Kaysen et al. (28) studied a subset of the HEMO population to examine the effect of nutrition per se on serum albumin levels. They concluded that a decline in serum albumin concentration in dialysis patients is related to an inflammatory response secondary to the hemodialysis procedure. The relevance of the HEMO study population to issues of starting dialysis in advanced chronic kidney disease (CKD) is not certain, because the enrollees in the HEMO study were prevalent and not incident patients. Nevertheless, Friedman and Fadem (29) emphasized that serum albumin levels are primarily morbidity markers and not nutritional markers, and that patients with severe malnutrition, including those with marasmus and anorexia nervosa with extremely low body mass indices, have normal serum albumin levels. In a 1999 survey of why nephrologists initiate early dialysis, “malnutrition” was given as an important factor by 72% of the respondents (30). Nevertheless, available evidence does not support the notion that dialytic small molecule clearance promotes survival. Initiating dialysis in patients with advanced CKD may improve nutritional parameters, but this effect may not be sustainable at current levels of intermittent dialysis frequency and duration. On the other hand, current evidence does support a beneficial role of the continuous supply of residual renal function for both nutrition and survival. Incident and prevalent hemodialysis patients have high prevalence of left ventricular hypertrophy, systolic and diastolic cardiac dysfunction, and ischemic myocardial disease and are prone to sudden cardiac death (31). Hemodialysis may promote non–coronary artery disease–related transient myocardial ischemia; myocardial “stunning”; cardiac structural changes; and worsening of underlying systolic heart failure and ventricular arrhythmias (31–33). Pun et al. (34) reported a relationship between residual renal function level and sudden death incidence. Compared with nondialyzed patients with eGFR <15 ml/min per 1.73 m2, dialyzed patients had twice the rate of sudden death (12% versus 24%). European guidelines consider uncontrolled hypertension an indication to initiate dialysis early (7). However, aggressive ultrafiltration to achieve “dry weight “comes at a cost of loss of residual renal function (35). Kidney Disease: Improving Global Outcomes consensus guidelines on hypertension refer to the rarity of BP control with aggressive ultrafiltration (36). Thus, studies raise the possibility of a cardiovascular disadvantage of dialysis, particularly when accompanied by the need for large volume ultrafiltration. On the other hand, dialytic ultrafiltration is often a lifesaving procedure in patients with pulmonary edema, regardless of their eGFR and CKD stage. In these patients, it may not be possible to preserve residual renal function and safely maintain a patient free of symptoms of fluid overload. Since 2001, 10 observational studies have examined the issue of comorbidity-adjusted survival versus eGFR level (as assessed by the serum creatinine-based MDRD equation) at dialysis initiation. All but two of these studies found a comorbidity-adjusted survival disadvantage of early dialysis initiation, possibly underestimated by “lead time bias” (37–47). LaSalle et al. (42) found this disadvantage only in patients with the highest level of predialysis comorbidity. Three recent observational studies—one using the U.S. Renal Data System database of 896,456 patients (44), one from Canada with 25,900 patients (47), and the other from Taiwan with 23,351 patients (43)—found a graded survival benefit associated with lower eGFR, with the best survival in the 0 to 5 ml/min per 1.73 m2 in the U.S. and Canadian studies and <3.27 ml/min per 1.73 m2 in the Taiwanese study. All of these observational studies may have been confounded by the strong effect of decreased muscle mass on serum creatinine-based eGFR. Beddhu et al. (39) found that, using 24-hour urine creatinine clearance–based measure of renal function, the adverse impact of early starts was eliminated. The explanation for the latter finding was that MDRD eGFR may overestimate renal function in patients with advanced stage 5 CKD and accompanying muscle wasting (somatic malnutrition) often related to underlying comorbidities. Similar results were reported by Grootendorst et al. (48), especially in diabetic early starts. Beddhu et al. also found, in new dialysis starts with body mass index <19.2 kg/m2 and serum albumin <2.5 g/dl, the MDRD equation likely overestimated GFR (49). Rosansky et al. (47) reported on a cohort of U.S. incident hemodialysis patients, accumulated over 10 years, with no reported comorbidity other than hypertension (a “healthy” cohort), stratified by their initial serum albumin level. In the “healthiest” patients with predialysis initiation serum albumin ≥3.5 g/dl, early start of hemodialysis, as defined by an eGFR ≥10 ml/min per 1.73 m2 was associated with higher mortality after initiation of dialysis. The potential overestimation of residual renal function by a creatinine-based estimating equation might have been reduced in this study because it excluded diabetics, had only 6% of patients with body mass index <18.5 kg/m2, and showed the most marked effect in the “healthiest” patients. None of the aforementioned observational studies could adjust for a “survival of the fittest” effect, because the late start groups may not include the sicker patients who died before dialysis initiation. The Taiwan study may have less of this bias because of a low rate of death from other disease in their stage 5 CKD population (50). The study by Rosansky et al. minimized this effect by examining a “healthy” subset of the U.S. hemodialysis population (47). Nevertheless, observational studies lack random assignment to early or late start and information on the reasons for dialysis initiation. The randomized and controlled Initiating Dialysis Early and Late (IDEAL) study eliminated the survivor bias issue by random assignment of patients prospectively to early or late start of dialysis (45). The IDEAL study used Cockcroft-Gault estimated creatinine clearance equivalent to an MDRD eGFR of 7.2 and 9.0 ml/min per 1.73 m2 for the “late” and “early” start groups, respectively. Waiting until eGFR is <7.2 ml/min per 1.73 m2 did not confer a survival advantage or disadvantage after dialysis treatment started. Because many of the subjects randomized to late start actually started dialysis early, based on their physician's recommendations, one might interpret this study as indicating that waiting until the eGFR is ≤9 ml/min per 1.72 mm2 or less is safe for initiating treatment, in the absence of other compelling reasons such as fluid overload. In the Adequacy of Peritoneal Dialysis in Mexico trial of peritoneal dialysis, Paniagua et al. (51) reported that increased dialysis clearance had no effect on quality of life (QOL). Dialysis patients often show a decline in health-related QOL with time on dialysis (52). They also have a high prevalence of sleep disorders, depression, pain, and anxiety. A dialysis patient with poor general health perception (low QOL score) will have a much higher risk of death and hospitalization compared with those with higher QOL score (51). Depressive symptoms, common in the dialysis population, double a patient's likelihood of death (53). Importantly, QOL trends in a sample of the U.S. dialysis population remained unchanged between 1997 and 2006, despite the previously described trends toward early start during a comparable period of time (54). Dialysis patients in the United States >75 years of age have high annual infection-related hospitalization days and more frequent withdrawal from dialysis compared with younger patients (8). A sample of frail dialysis patients residing in nursing homes showed a sharp decline in functional status after dialysis initiation (55). Patients >85 years of age in the United States have an expected survival after dialysis initiation of <12 months (56). In the United Kingdom, in a sample of elderly patients who choose conservative nondialytic management, 27% died in hospital versus 65% of those who chose dialytic therapy (57). In addition to poor functional status and survival, elderly patients have a slower rate of decline in their MDRD formula–based endogenous renal function (58). This might be because of a slower rate of GFR loss or the superimposition of muscle mass loss leading to a blunting of the “apparent” rate of decline in “renal function” or both (see below). Once on dialysis therapy, older patients may lose renal function more rapidly than younger patients (35). Altogether, these observations make it difficult to justify early start of dialytic therapy based on eGFR measurements alone, especially in the frail subset of elderly patients with high comorbidity. In addition to conferring a survival benefit, residual renal function correlates with better fluid balance, phosphorus and anemia control, and better nutrition and QOL (35,59,60). It may also correlate with decreased inflammatory markers, decreased atherosclerotic and vascular calcifications, superior BP control, and enhanced removal of middle and large molecular weight solutes (61,62). Hemodialysis and peritoneal dialysis patients lose approximately 50% of their residual renal function after 6 months on dialysis, probably slower with peritoneal dialysis than with hemodialysis because of fewer episodes of low BP and less aggressive fluid removal (63). On the other hand, one study suggested that peritoneal dialysis may actually slow loss of residual renal function, but this is the only study to suggest this reverse effect of dialysis on residual renal function (64). Because even low levels of residual renal function provide clinical benefits (6,14,16,20), early dialysis initiation that can lead to accelerated loss of 5 to 10 ml/min per 1.73 m2 of endogenous renal function is difficult to justify. In a Norwegian population with eGFR 25 to 55 ml/min per 1.73 m2, the mean renal function trajectory was 1.0 ml/min per 1.73 m2 per year (65). Interestingly, 46% of these patients had stable eGFR or an increase in eGFR during a 10-year follow-up. The key predictor of renal function trajectory is the level of proteinuria (66). In an indigent population with stage 3 CKD exhibiting proteinuria compared with similar patients without dipstick proteinuria, the hazard ratio for dialysis initiation ranged from 4.21 for trace to 27 for ≥3 plus proteinuria (67). In the African-American Study of Kidney Disease, progression to ESRD was more than five times higher in proteinuric patients, and level of proteinuria, rather than aggressive BP control, was the predictor of renal function decline (68,69). Levin et al. (70) reported on a stage 4/5 CKD population with an average eGFR decline of 2.6 ml/min per 1.73 m2 per year. If a patient had an eGFR decline >5 ml/min per 1.73 m2 per year (rapid progressors), 76% went on to dialysis versus 27% for those with a <5 ml/min per 1.73 m2 per year decline. The rate of renal function decline, as assessed by eGFR, may be slower with increasing age (57). However, this must be interpreted with caution because of the decreasing muscle mass experienced by the elderly. In the Taiwan study, the superior survival in the <3.27 ml/min per 1.73 m2 eGFR population questions the CW that it is dangerous to wait until GFR is 6 ml/min per 1.73 m2 or less for initiation of dialysis (7,43). This guideline may be appropriate if a patient has a rapid renal function decline. For patients with a slow decline, especially the elderly with high comorbidity, dialysis preparation and initiation may initially be delayed. Optimizing predialysis care including access placement and using multidisciplinary medical management, as well as education and counseling, may provide survival benefits and obviate or substantially delay the need for dialysis. This approach may also preserve residual renal function and improve the outcomes once dialysis treatment is begun. Goldstein et al. (71) reported that patients attending a multidisciplinary predialysis clinic versus conventional care had better biochemical parameters at dialysis initiation, fewer hospitalizations, and better survival for 3 years after dialysis initiation. Wingard et al. (72), in a U.S. predialysis population, was able to achieve similar benefits. The possible adverse consequences of a patient's refusal to start peritoneal dialysis after predialysis counseling have been identified by Tang et al. (73). The small, nonsignificant difference in the survival of early- and late-start groups in the IDEAL study may be a reflection of the excellent predialysis preparation of all patients enrolled and the small number of patients who refused dialytic therapy when suggested by their physician. Lamiere and Van Biesen (74), in commenting on the IDEAL study, concluded that nephrologists were initiating dialysis “just in time” according to the patient's uremic symptoms. Signs of malnutrition, the most common reason given for early dialysis initiation (30), may relate to comorbidities rather than to renal function (75). The usual symptoms and signs used to initiate dialysis, including fatigue, nausea, and anorexia, are nonspecific and often correlate with older age and concomitant comorbidities (75). Clinical features interpreted as “uremia” are not predictable and have no influence on survival (64). Disentangling these features of comorbidity from “uremia” can be difficult. Nevertheless, the decision to initiate dialysis early in the late start group of the IDEAL study may have been appropriate. There are four groupings of patients to consider regarding dialysis initiation (Table 2). These include patients who (1) receive dialysis related to a combination of renal failure and end-stage heart or liver failure, where dialysis is used primarily as a means for fluid management; (2) have acute renal failure that progresses to irreversible chronic renal failure; (3) have an acute superimposed on chronic renal failure clinical course; and (4) have a gradual decline in renal function and have a planned dialysis start date. For this latter population, results from the recent observational studies and the IDEAL study support conservative multidisciplinary management of asymptomatic patients with eGFR levels in the 5 to 9 ml/min per 1.73 m2 range, with close follow-up to detect symptoms of uremia (Table 3) that may require a dialytic intervention. Estimation of GFR levels by the average of 24-hour urine urea and creatinine clearance may be more appropriate than relying on MDRD eGFR (48,49). Comorbidity-related symptoms may be difficult to separate from uremic symptomology. Nevertheless, at these levels of renal function (eGFR ≤ 9 ml/min per 1.73 m2), especially in the face of a rapid renal function decline, dialysis initiation may be advisable. For many frail elderly patients, with short life expectancy and slow renal function decline, multidisciplinary follow-up without access placement may initially be a more appropriate decision. The information reviewed here supports a contention that most of the CWs that have driven the “epidemic” of early dialysis initiation are not upheld by facts and evidence, and that early dialysis initiation does not consistently provide a mortality, morbidity, or QOL benefit, unless accompanied by compelling reasons for initiating treatment (such as severe volume overload). In fact, the current medical literature suggests that early dialysis initiation using creatinine-based eGFR for decision making may be harmful. Preservation of residual renal function has clear morbidity and mortality benefits. The efficacy of multidisciplinary predialysis patient monitoring and education in conjunction with planned dialysis initiation at GFR (by 24-hour urine average of urea and creatinine clearances) levels of 5 to 9 ml/min per 1.73 m2 for asymptomatic patients needs further study. Future studies examining indications for dialysis initiation and outcomes will contribute to evidence-based guidelines concerning the optimal timing for dialysis initiation. The authors thank Alice Griffin for her assistance in manuscript preparation and Emily Ginardi and Lynda Kunz for their help with obtaining reference material.